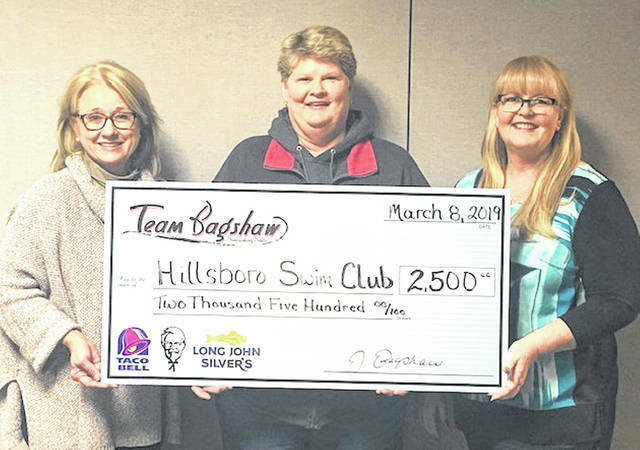 Pictured with the first check for the Hillsboro Swim Club Corporate Sponsorship Campaign, from left, are Jeanine Bagshaw, Team Bagshaw CEO; Joy Seaman, swim club board president; and Kelly Smith, corporate sponsor volunteer. It has been a staple of the Hillsboro community since 1957, and now several local residents are tying to breathe new life into the Hillsboro Swim Club. The idea for the sponsorship drive came from Jeanine Bagshaw-Rosselot, who said the pool was a large part of her childhood and beyond, and that she is passionate about seeing it be there for future generations to enjoy. Team Bagshaw, where Bagshaw-Rosselot is CEO, is currently assisting the pool’s board of directors with the sponsorship drive, and made the first corporate donation of $2,500. What the drive organizers are looking for is 45 or more corporate sponsors that can donate on various levels, and in return will have a banner advertising their business displayed at the pool during the 2019 season. The sponsors also will be provided with guest days passes, membership discounts, and a private two-hour event at the pool for those donating at the $2,500 titanium level. Corporate sponsorship levels are bronze for $500, silver for $1,000, gold for $1,500 platinum for $2,000, and titanium. Each level comes with a different set of perks like a banner ad of least two feet by six feet around the pool for the season. Corporate sponsors can also purchase more guest day passes for $10 each. Family sponsorships are also available. Family sponsorships of more than $100 will be recognized on a “Wall of Honor” located inside the pool clubhouse. Chad Abbott Signs has agreed to provide all the banners for only a membership. “We just wanted to help out and try to bring more attention to the sponsorship drive because it’s a good thing for the community,” Abbott said. There are also several new membership options. Family and grandparents membership are $250. A couples membership is $200, individual membership $125, student members (13-17) $125, senior membership (62 and older) $100, family monthly membership $150, and there are other options. Located at 635 W. Main St., the swim club offers special events throughout the season including moonlight swims, teen night swims, family fun nights, group and private swim lessons, and more. This year, community members, both those who are and are not members of the swim club, can schedule pool parties during pool hours or after hours. The pool is open daily from Memorial Day to Labor Day. Hours are 11 a.m. to 8 p.m. Monday through Saturday and noon to 8 p.m. Sunday. The pool’s board of directors include Joy Seaman, president; Ashley Marler, vice president; Jennifer Howland, treasurer; Alison Ballard, secretary; Karen Marler, membership coordinator; and board members Destiny Bryson, Jenny Hart, Melissa Hawk and Buck Wilkin. To learn more about corporate sponsorship opportunities, call Kelly Smith at 937-393-9959 ext. 122. The pool can be reached at 937-393-2505.